Doyenne du Comice produces pale green pears in October that are juicy with a rich, sweet flavour. 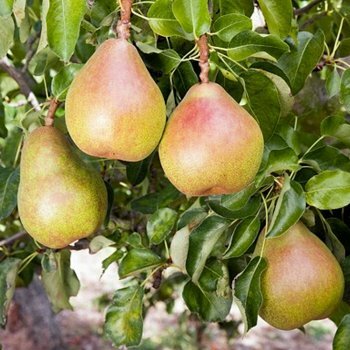 The texture and flavour of Doyenne du Comice pears is outstanding and makes it worthy of its RHS Award of Garden Merit. Although not as reliable in its crops as some pear varieties and requiring a good pollinator ('Concorde' is ideal), many say that it is worth it for the delightfully delicious fruits that follow the pretty white spring blossom. Doyenne Du Comice requires a suitable pollination partner. Pear trees should be spaced according to their rootstock, for example a Quince A (semi-vigorous) rootstock will require approx. 3 metres between trees, whereas a Quince C (dwarf) rootstock will require approx. 2 metres between trees. Pot grown pear trees can be planted at any time of the year but bare root pear trees need to be planted between November and March. Remove weeds and grass within a metre of your desired planting hole then dig a hole slightly deeper than your root mass and approximately 3x as wide. To help pear trees establish more effectively, apply root grow. Then gently loosen the roots and place into the planting hole. Using 50% of the original soil and 50% compost, fill in the hole and firm around gently without banking soil up around the collar of the tree.